Wheat flour contains a protein known as gluten. Flours are labeled differently in the store to reflect their varying gluten, or protein, levels. This helps you understand which flours to use for specific recipes. Using a flour with too little gluten can prevent your yeast breads from rising. 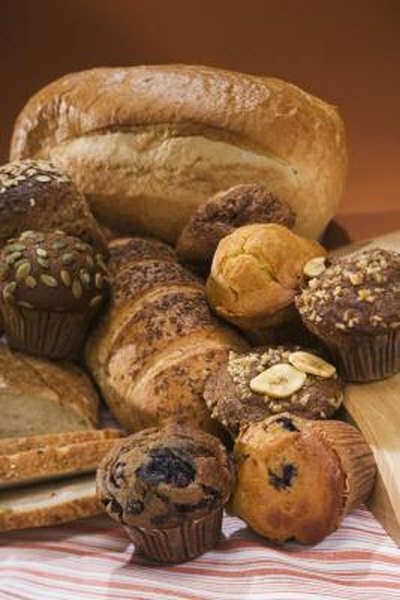 If you use a flour with too much gluten for cakes or muffins, you might end up with heavy, dense baked goods, instead of light, delectable ones. High-gluten flour, also called high-protein or strong flour, contains 13 to 14 g of protein per cup, making it 11.5 to 12.5 percent protein. It is best for yeast breads, pasta and pizza dough. The proteins in flour, when mixed with water or other liquid, bind together and stretch, creating layers that trap gasses made by yeast and creating a chewy texture. High-gluten flour may also be labeled as bread flour. Self-rising flour contains leaveners, such as baking powder and baking soda. Per cup, self-rising has between 9 and10 g of protein, making it 9 to 10 percent protein. Self-rising flour cannot be used for yeast breads, but is appropriate for biscuits, quick breads and muffins. Whole-wheat flour contains the germ and the bran of the wheat kernel. Whole-wheat flour has less gluten than white flour because it contains the additional parts of the kernel that take up space. Yeast breads made with whole-wheat flour can be quite dense, so it is often mixed with white flour to create a lighter bread. Southern millers create flours with a light texture that weigh less per cup than other flours. They contain about 9 g of protein per cup, equaling 7.5 to 9.5 percent protein. Bakers swear by these light flours for flaky pie crusts, light biscuits and delicate quick breads and muffins. You find fine, instant flours in canisters in the flour section of the supermarket. These flours contain 9 to 10 g of protein per cup, or 9.5 to 11 percent protein. Rarely would you bake with one of these flours alone. Rather, use these flours to thicken sauces and gravy. Cake flour has the lowest protein content of all flours with just 8 g or 7.5 to 8.5 percent. Cake flour turns out moist, light cakes, quick breads, muffins and pancakes. It absorbs less water than high-protein flours.